Airships sail the skies, two-fisted heroes roam the streets, mysterious ruins dot the landscape â€“ but with the Second Great Conflict looming over the world of Haven: City of Bronze, all of these find themselves in the shadow of that cyclopean avatar of anthropomorphized industrialization: the mechanized armor suit! Destined to play a pivotal role in the coming global war, mechanized armor has been developed all over the world in the years since the First Great Conflict. Equal parts armor, artillery and intimidation, it is considered a vital piece of the war machines of the great powers from the last war and a potential equalizer for the upstart factions hoping to oust them from the forefront of history. Now you can take control of these mechanical monstrosities, with a collection of eleven of the most famous and iconic armors of the early Second Great Conflict. 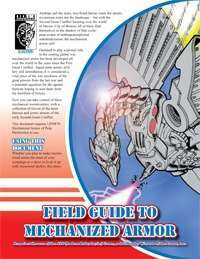 This PDF requires LPJ9878: Mechanized Armor of Pulp Destruction to use. This 12 page PDF is just the sort of thing needed for GMs to add depth to any great d20 Pulp campaign world, including Haven: City of Bronze. Written by Joshua Cole. This title was added to our catalog on December 11, 2006.